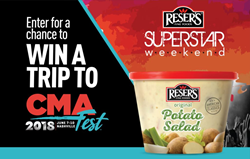 Reser’s Fine Foods is excited to announce to Country Music fans everywhere that it is a Proud Partner of CMA Fest® in Nashville, TN June 7-10. CMA Fest is the Ultimate Country Music Fan Experience and Reser’s will be on-site to make the event even more enjoyable for the tens of thousands of fans who attend daily. The event features multiple stages and offers 100+ hours of music from hundreds of participating artists and musicians. “We are happy to welcome Reser’s Fine Foods as one of our newest CMA Fest partners! They have gone all-in for this first year of their partnership. We all know that nothing goes better with great food than great music, so having Reser’s on-site will be a special perk for CMA Fest attendees,” states Damon Whiteside, CMA chief marketing officer. Four (4) Grand Prize Packages: Dust off your cowboy boots for a five (5) day, four (4) night trip for a winner and one (1) guest to Nashville, TN, June 7-10, 2018. Includes roundtrip coach air transportation, four (4) nights hotel, two (2) 4-Day reserved seat passes to attend CMA Fest including nightly concerts at Nissan Stadium; and $300 spending money. Grand Prize package valued at approximately $4,700. Twenty (20) First Prize Packages: A mix of CMA Fest premiums and Reser’s product valued at approximately $100. Two Hundred (200) Reser’s Prize Packs: Reser’s branded items valued at approximately $25. The Ultimate Country Music Fan Experience™ began in 1972 as Fan Fair®, which drew 5,000 fans to Nashville’s Municipal Auditorium. Now in its 47th year, the legendary Festival has become the city’s signature Country Music event that hosts in excess of 50,000 fans from every state and two dozen foreign countries. In 2017, CMA Fest featured 11 stages with over 350 artists, 1,100 musicians, and 167 hours of music – all to benefit music education. Since 2006, CMA and the CMA Foundation have donated more than $20 million to sustainable music education initiatives across the U.S. thanks to the fans who attend CMA Fest and the artists who perform for free. CMA Fest is filmed for a three-hour ABC Television Network special – the only U.S. music festival with an accompanying TV event. 2018 marks the 15th consecutive year of the broadcast. Family owned and operated, Reser’s is the leading provider of fresh refrigerated deli salads, side dishes and prepared foods. For more than 65 years, Reser’s has been making fun times easy and affordable for every family. Reser’s famous deli salads and sides are family favorites at the race track, picnics, BBQs, Country Music festivals and tailgates. Founded in 1950 Reser’s operates 14 facilities in the United States and Mexico and employs more than 4,500 employees in the United States, Mexico and Canada. Visit http://www.resers.com.